September is the beginning of American ginseng season here in Arkansas, or as the old-timers call it ‘sang. We are lucky to have such an amazingly beneficial plant growing nearby, but we need to make sure that we protect it. If you are lucky enough to know a ‘sang hunter or are one yourself, make sure the rules are followed about planting the red berries 1-2 inches deep when the root is harvested. American ginseng grows throughout the Eastern United States, but it tends to grow in small clusters and has a lot of harvesting pressure on it. Since it is monetarily valuable, unscrupulous hunters will over harvest an area. For instance, trespassers stole my friend’s ginseng patch that he had been cultivating for over 20 years. Efforts need to be made to insure that we will continue to have this jewel of a plant in our region, by buying American ginseng from organically grown or ethically wild harvested sources. American ginseng is so invaluable because it helps relieve stress and soothes the digestion. Its actions on the digestive tract are partially through direct action, but many of ginseng’s effects are due to the stress reduction. When we are stressed out, our ability to digest food is diminished. By calming the impact of stress on the body, American ginseng may help many cases of indigestion. 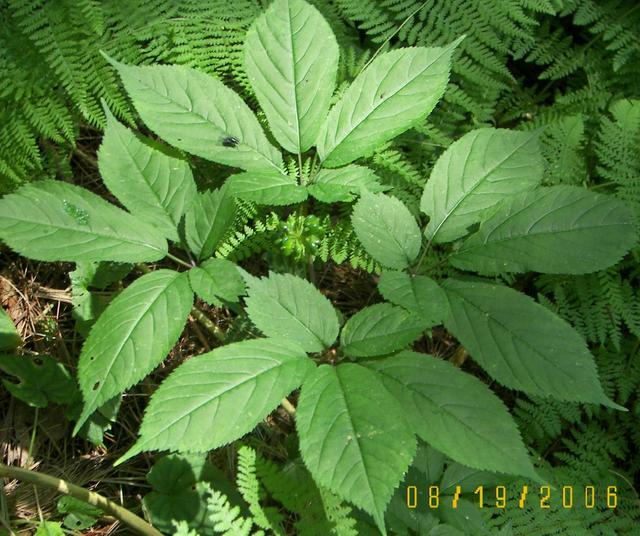 Use of American ginseng has also been shown to reduce the incidence of colds. Again, the immune system is suppressed by stress through excess production of cortisol, the stress hormone. American ginseng can also be useful for diabetes, because, you guessed it, stress contributes to insulin resistance. It is also a good herb for fatigue, especially tiredness due to over work. American ginseng probably also shares the ability of its close cousin Asian ginseng to help prevent cancer. In the regions where the most Asian ginseng is consumed, cancer rates are significantly lower. Don’t expect these fabulous benefits overnight. American ginseng is used long term since it may take weeks or months for the full effect to be noticed. This is a very safe herb that most people can use, but it is a little bit stimulating and, in some people, could contribute to insomnia. Taken early in the day, most people have no issue with American ginseng, and it may even improve their sleep. This entry was posted in Health and tagged adaptogens, American ginseng, colds, diabetes, digestive health, flu, GI Health, immune support, indigestion, insulin resistance, stress, upper respiratory infections. Bookmark the permalink.